Transmitted on the BBC (producer : Julian Hall), on 31st December 1951, recorded on 19th December 1951. Transcribed from Casson’s original typescript for the BBC. For obvious reasons, the original, idiosyncratic punctuation and so forth, have been retained throughout. The year 1952 marks the centenary of the birth of William Poel, a remarkable genius of the Theatre, who, during most of his working life was comparatively unknown, (and looked on (by many of those who did know him) as a crank), yet whose ideas and practice have deeply affected our theatre, both directly in the production of Shakespeare, and indirectly in the matter of the mutual relations between the actor, the audience, and the building which houses them, by restoring freedom to the dramatist and producer, bound of late by the limitations of a too rigid naturalism and the proscenium stage. I met Poel first about 1901 when he had just discovered the old Morality Everyman and given it the moving and beautiful production which has been reproduced again and again in every part of the English-speaking world. He was then, I suppose, in the middle forties ; tall and well built, but with the stoop of a scholar. Longish grey hair brushed back from a high forehead – going bald. The head thrust forward enquiringly, little twinkling eyes half hidden by steel spectacles got well down his nose, over which he peered at you, with an air of vague eagerness, and the general aspect of a kindly old don. Henry Tonks, William Poel as Father Keegan, circa 1932. National Portrait Gallery, reproduction in the public domain. 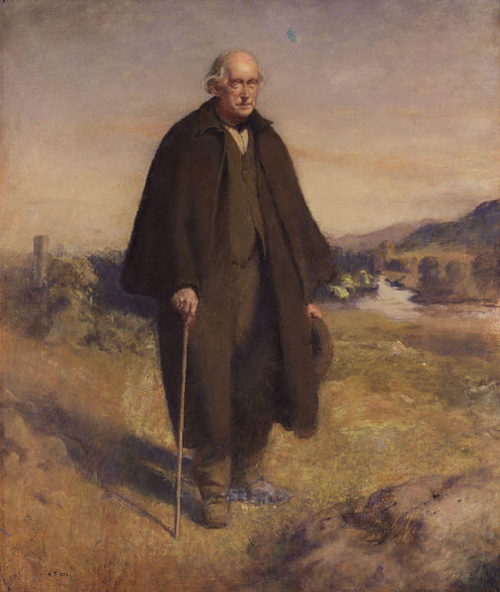 The Tonks portrait in the National Gallery, which shows him, at his request, in the part of Father Keegan looks much as he did in real life, and I remember well that Inverness cape in our long walk on Wimbledon Common. His speech was hesitant and almost stammering, punctuated by the queer interjected “Ah rumptarrah”. Charming, loveable as he was, he could be obstinate almost to fanaticism in carrying out his ideas. I am afraid we youngsters in those early days took him less-than-seriously, and might with profit have hearkened to Hamlet’s “advice to the Players” in the matter of Polonius. He was an actor, but not a good one and he knew it and only played to save expense or if he couldn’t find an actor to carry out his ideas of a part. He was of too simple and trusting a nature ever to succeed in the business side of the Theatre. He never made any money, and if ever he came by any he spent it at once on his beloved Elizabeth Stage Society. He had only one financial success, Everyman, and he took a partner to exploit that, who did much better out of it than he did and out of the tours in America that followed of Everyman and Shakespeare played according to his ideas. Poel’s main thesis was that every play (meant to be performed at all) was written by the dramatist with a particular form of theatre in mind, and a particular style of production ; and since he believed Shakespeare was suffering more than anyone from wrong-headed production, most of his work and writings were devoted to him, with the result there is hardly a single production of Shakespeare in this country today, that does not in some measures show his influence. He believed and proclaimed that Shakespeare knew his job, not only as a popular dramatist but as a practical man of the theatre and that we had only to find out what he did and follow it, to realise what he meant and to make it manifest. But we have, alas, to “find out” for we have no unbroken tradition as the French have for Molière. The Puritans broke the line, and when it was resumed Shakespeare fell into the hands of people who thought he did not know his job, and accordingly started “improving” the plays. Even his close friends and fellow-actors Hemynge and Condell, as soon as he was dead, chopped the plays into Acts and Scenes because it was more classical. And very soon the theatre-men began hacking the plays about, cutting and re-arranging, given them happy endings, slowing them up with pompous pseudo-classical speech and loading them with scenery. Much of this vandalism was cleared away by such men as Macready and Charles Kean long before Poel’s time, but when he started, about sixty years ago, (though lip-service (as to a god) was paid to Shakespeare) yet in the theatre there was the same lack of faith in the plays themselves ; the same fear that the audience would be bored without continual changes of scenery, (always more solid and more elaborate,) with intervals for the changes and music to cover the noise ; and more and more (business’ to keep them amused without listening to the lines (already cut to the bone to make room for the excrescences). The one thing that had gone was the pompous “over stylised” speech, but alas, it was soon to be replaced by the new “conversational” style, which is even worse. The full text in its proper order without interpolations or re-arrangement. Continuity of speech from scene to scene without breaks between the “Acts”. A permanent architectural set with at least two levels, and an inner stage covered by a traverse curtain. A wide platform stage projecting into the audience. Elizabethan dress (with a few period modifications). Rapid, highly coloured, musical speech of great range and flexibility. He began preaching his gospel in lectures and pamphlets, and then (with the help of such men as Arthur Dillon and Stewart Headlam) he was able in 1894 to found the Elizabethan Stage Society and produce some of the plays according to his theories and for many years he continued to give odd performances when he could get the money. These rapidly converted the more discerning critics like Bernard Shaw and dear Robin Littlewood (now father of the Critics Circle). The professors followed. Quiller Couch’s New Cambridge edition of the plays, (showing how the use of the upper and lower and inner stages illuminated the action), marked a great advance, and the work of Dover Wilson, Nevill Coghill and George Rylands among others has compelled the regular theatre and the public to take notice. The schoolmasters, too have done much. The Elizabethan production in the twenties by the Choir School at All Saints, Margaret Street, under Father Hoald, were rendered noteworthy by their leading boy, by name Laurence Olivier, but many other schools were doing similar work, Nugent Monck too, one of Poel’s early apostles, has made his Maddermarket Theatre for enthusiastic amateurs at Norwich famous over the world by thirty years of Elizabethan staging. Official recognition came in 1904 when the London County Council, at Stewart Headlam’s instigation, actually commissioned Poel to do a tour of Much Ado round the London Town Halls (a young dramatist, Monckton Hoffe, played Don John, I remember). At last, in 1904, the Governors of the Stratford Memorial Theatre asked him to produce a play for them, and he chose “Measure for Measure”. With Miss Horniman’s co-operation he used her Manchester company, (of which I was then a member), so, to my great delight, I came again under his direction. This was his first and only recognition by a regular theatre Management. Except for Robert Atkins at the Ring in Blackfriars in 1936 I know of no Management that has accepted Poel’s full gospel. I doubt if they ever will. Tradition dies hard in audiences as well as producers, and a too rigid adherence might keep them out of the theatre ! But though the regular theatre made no direct use of him, the leaven of his teaching was at work, and his first three main principles are now accepted, both by producers and public, the full text in proper sequence, continuity and a permanent setting or scene. These three are indeed interdependent. The number of “scenes” in the full text with re-arrangement involves too many scene changes ; and vocal continuity precludes the use of the fall of the curtain or the more modern blackout. In Poel’s time, which was Irving’s and Tree’s, heavy cutting and the rearranging of the order of scenes, and innumerable falls of the curtain and musical intervals, were in full swing. Cutting may be legitimate enough in the case of passages now unintelligible, and surely – to paraphrase St. Paul’s advice on marriage “It is better to cut than to bore,” even if the fault lies in the actor or producer rather than the dramatist. Most producers now however treat the text reverently, and at least refuse to cut merely to increase the importance of the leading part, as the actor-managers frequently did. Vocal continuity too, or at least continuity of action throughout is now generally recognised as a necessary element in the construction of the plays, not only as part of the musical pattern, but also for the rapid changes of colour and movement that seize and hold the attention. When the necessity of continuity was recognised it was at first achieved by some compromise which still used representational and changing scenery. The device of alternating front scenes and full-stage scenes for instance. But this often cramps important scenes and is, in any case, fidgety. A better device was that invented by Antoine in Paris about 1906 of using the full stage depth for each set, with tableau curtains that closed before the end of the scene, leaving the action to be finished on the front stage while the new scene was set. This method combined with a revolving or rolling stage is very effective, though it tends to be noisy. But more and more it is being recognised that Poel was right ; that Shakespeare’s plays call for the open unlocalized stage that he wrote for, stimulating the audience to create for themselves in their imagination the beauties of the local habitation enshrined in the words ; and in the future some form of fixed set, (with variations that can be made in sight of the audience, or by change of lighting) is likely to become the rule. Instances of late are the Old Vic Othello, Peter Brook’s Winter’s Tale, and John Gielgud’s Much Ado. Modern producers are limited as to what they can do, by the existing theatres with their fixed proscenium and unalterable line of sight, but they would maintain that they have accepted the principle of the platform stage, the use of an apron or extension over the orchestra outside the proscenium arch, where that is possible. Granville Barker did this at the Savoy for his wonderful productions in 1912, and I followed it for Julius Caesar at Manchester in 1913, and was soundly rated by Mavis Horniman for the daring innovation. Bridges Adams installed one in the rebuilt Stratford theatre in 1932. Robert Atkins had a much more efficient form at the Old Vic, but his true platfom at the Ring convinced him that Poel was right, that none of these were adequate. Poel granted that such an apron increases the intimacy between audience and actors and gives some of the three-dimensional effect of the true platform. He insisted, however, that the open platform, or the open arena (surrounded (or almost so) by the audience) alone provided the proper setting for plays which were never intended to be realistic or to be spectacles to be gazed at. They were games played by the audience as on the nursery floor, which they could make a ship of a battlefield at will, with soliloquies and asides talked to them with greater personal intimacy than those of George Robey or Danny Kaye. Only under the principle of a completely unlocalised stage is it possible to accept such things as two opposing armies on the stage together defying each other. In any localised setting they are absurd. This whole question is admirably treated by Ronald Watkins in his book based on his experience of productions in the Harrow speech-room. Before leaving this subject I must point to the undoubted success of the use of the Elizabethan stage this season at Stratford for the Histories Cycle, and of Bernard Miles’ beautiful little Mermaid Theatre in St. John’s Wood ; also of the touring Arena Theatre. All these things are accustoming our audiences to a much more imaginative attitude to the theatre, both for Shakespeare and for the more experimental types of modern plays and opening up new possibilities of freedom to our dramatists, no longer bound by the rigidities of the fourth wall. Two more principles remain to be discussed – Dress and Speech. As to the former, Poel contended that in whatever he was writing Shakespeare drew his characters as Elizabethan, and that therefore they should so be dressed, at least as a basis, though modifications and trimmings are permissible, such as togas for Romans, Greek helmets and so on, to suggest another period. Poel held that any attempt to dress such plays as Cymbeline, Lear and Antony strictly in their alleged period only led to absurdities like “Cut my laces, Charmian”, and emphasized the many anachronisms. Actually the idea, of dressing the plays archaeologically is not more than about a hundred years old. Before that actors wore ‘modern dress’ of their own period, somewhat stylised for theatrical effect. But it must not be thought that Poel advocated drabness in costume. He had a fine small wardrobe of Elizabethan dresses (which, alas, appeared over and over again in his various productions) with such enrichment from costumiers as he could afford. But had he had the money he would have filled his stage with the splendours of cloth of gold, banners and heraldry, wherever it was justified. He had a fine eye for colour and his grouping and movement owed much to his loving study of old pictures in our National Galleries. His influence on dress in productions of our time has been indirect only, but at least has freed the modern designer from the bonds of rigid archaeology, and so allowed him to use costume as a direct stimulus to the imagination of the audience in the interpretation of both play and character. Poel himself always considered his work on the speaking of the plays by far his most important contribution to the problem of producing them. Yet at the time it made little impression, and only recently has its indirect influence become apparent. But it is noticeable that many of our best speaking actors today either came under his direct influence in his own productions, like Edith Evans or under that of producers who worked him like Barker, or may I say myself. Poel held that Englishmen of Shakespeare’s day had, if not actually more vitality than those of today, at any rate more exuberance in the vocal expression of it, and that as there was, in those days far less dependence on silent reading and print and much more on the spoken word, there was much greater interest in the sound of words and the rhetoric of everyday speech. Therefore, even on the realistic plane, if we are representing Elizabethans we must use much more highly coloured and vivid speech than we do today. Moreover Shakespeare was a poet. He could create magic by the mere sound of words, and while charging those words with intense meaning, he could so write that if the speaking fully expresses the meaning and emotion the resulting melody and music of it creates the magic. It is the actor’s task to make manifest all the meaning, the emotion, the magic and the beauty, by the audible means of melody, phrasing and stress. And the miracle of Shakespeare is that it is possible, with sufficient skill, to do all this while creating a character in whom the words sound natural, and as if invented at the moment. But it requires both vocal imagination that can take a long view of perhaps a dozen lines of blank verse and compose one interesting melody that will include them all, and also the breath and flexibility of voice to carry it through. Few actors have that flexibility, alas and still fewer have any chance of cultivating it, with the result that they usually fall back either on some standard patter of almost meaningless “Shakespearean speech”, “ponging” as the Bensonians call it, or try to make it natural in the style of modern conversation by breaking it up into short sentences spoken to a series of dull repetitive “tunes”. Now Poel himself had, in a very high degree, both the vocal imagination and the vocal flexibility, together with immense knowledge and intuitive perception of the plays themselves. But he had little money, so could afford neither a long period for rehearsals, nor highly skilled expensive actors, and he had to get results which would show what he was trying to do. He was driven, therefore, to the use of a method of rehearsing which some actors found inspiring but many others found stultifying and absurd and it was largely this method that earned him his reputation as a crank. His first step was to cast the play orchestrally. He decided which character represented the double-bass, the cello, the wood-wind, so to speak and chose his actors by the timbre, pitch and flexibility of their voices, far more than from their experience or even their skill. Before starting rehearsals he had worked out (within fairly wide limits) the eventual sound of the whole play ; the melody, stress, rhythm and phrasing of every sentence, and for the first three weeks of a month’s rehearsal the company sat round a table, as in a school class-room and “learnt the tunes” from him by endless repetition in a strongly marked exaggerated form ; so that at the end of say two weeks the whole play had become as fixed in musical pattern as if written in an orchestral score. He used an immense range ; the melody of a single sentence might cover two octaves, or a general rise or fall of two octaves might be repeated over twelve lines. He could, and did, justify every intonation of the pattern by its rhetorical value and the thought and emotion to be expressed, but when it came to the acting and the minute harmonies and variations that make the speech alive and natural, it had all to be fitted into the main framework of his imposed pattern, just as the players in a string quartet express their own personalities and skill (co-operatively) within the framework of the written score. It was a drastic method, more acceptable to actors who work for the play than for those who work exclusively for self-expression, but with the former it produced remarkable results. He contended, without any conceit, that he had an ear beyond any of his actors in hearing and analysing the small-scale intonations and phrasing of natural speech and an ability to extend them in range and timing to the scale necessary to make them manifest to a theatre audience, and yet at the same time to build all the resultant melodies into one musical shape. The general effect was one of swiftness and lightness, with a minimum of heavy stresses even in strong dramatic passages. I had some thoughts of concluding by giving some examples, but that would be infringing the rights of the Drama Department. Tonight I am not an actor, merely a talker. 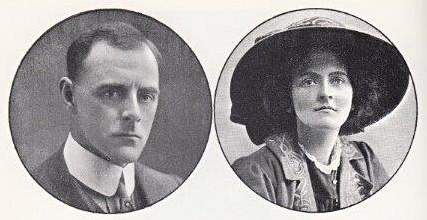 Lewis and Sybil in 1908. First published in Equity News, (British Equity Monthly), March 1951. I was asked officially, the other day, to define what acting is, and how far it can be taught. This is what I wrote. The basis of acting is an imaginative sympathy with all forms of life ; a power to imagine oneself existing as another person or living thing, and to live, think and feel as that other person or thing, in imagination, or in impersonation, or both. This imaginative sympathy is closely allied with auto-suggestion and day-dreaming, and is present in some degree in every human being. One of the chief values of the Theatre is the widening and deepening of our emotions by cultivating and disciplining this faculty to the utmost. In the dramatic artist it must be both inborn and cultivated in a high degree. In whatever degree it is present it can be developed by keen observation of life (either directly, or indirectly by reading) and by the study and practice of acting ; and these can be greatly stimulated and guided by expert criticism and teaching. The dramatic artist must have strong vitality and a marked personality of his own with which to impress others and attract their interest and attention. These attributes cannot be implanted by teaching, but by the study and practice of relaxation, acting, singing, public speaking, etc. the power of projecting that personality and generously giving it, can be greatly developed. Expert tuition and criticism can help in that direction, and the results can be assessed. Invent a character appropriate to the dramatist’s design and to the mood and period of the play. Present that character to an audience on a scale commensurate to the size of the building, so as to create the illusion that the character is an autonomous living being, and to make manifest to the audience, so far as the action requires, the words, thoughts and emotions of the character, compelling the audience to think and feel with it. Co-operate with others in the creation of the emotional tension, atmosphere and shape of the play, subordinating, as far as is necessary, the individual to the whole, and personally seizing and holding the audience’s attention whenever the action requires it. Set a standard of clear, lucid speech, and to show forth in rhythm, tone, melody and movement, the beauty of form latent in the written play. The mastery of all these is greatly assisted by the tuition and criticism of those who have studied and practised the art, and are familiar with the traditions, conventions and difficulties. The technical skill can be judged, and the results assessed. In the dramatic artist, it must be both inborn and cultivated in a high degree. First published in the Equity Letter, a bi-monthly report to the members of the British Actors’ Equity Association. July 1948. The British Theatre has made great advances of late years in beauty and significance in all the visual arts. Dancing, scenery, lighting, grouping, movement, colour and costume ; in all these the theatre is alive and growing ; and on the musical side the standard of accomplishment demanded of the executant, whether soloist or orchestral player, has never been higher. But in one art there has been no advance, the use of the speaking voice. I am not speaking now of the obvious scandal of inaudibility (though even that is due far more to the lack of beauty of phrasing, variety of melody, and truth of vowel tone than of volume and articulation). I mean that in the theatre now there is little attempt to make actual speech one of the elements of the beauty of a production in the way that beauty of movement and singing are of Ballet and Opera. For many years now we have decried any form of style in speech and relied almost entirely on “naturalism” – the imitation of the improvised formless speech of the outer world. Instead of setting a standard of beauty, the theatre follows the crowd. When it should be continually showing how vivid, highly-coloured and significant speech can be, it meekly accepts, in the interests of naturalism, the dull monotony of the bank and the drawing room ; and at a time when educated English speech was never more slipshod and more unworthy of imitation. Why should a dramatist trouble to balance his vowels, words and rhythms to give his prose or verse significance and beauty, if the actor is going to jazz it up into syncopated fragments in “order to be ‘natural’” ? A written play is an orchestral score in which are implicit all its thought and emotion. These the actor must first appreciate, and then translate into the beauty of his own executive art of speech and movement, making significant and explicit, to his particular audience, whatever its size, the implicit thought, emotion and beauty, and so blend his work with that of his fellows that the whole play becomes a flowing line of movement and sound like an orchestral symphony, with a clear melodic style and pattern, interesting and significant even without the sense of the words. But this requires a much higher standard of vocal imagination and flexibility than are generally to be found in our actors, possibly because though musicians, dancers, and singers consider regular practice and critical coaching (apart from rehearsal and performance) necessary to their art, actors apparently do not ?